Pre-heat oven to 375. In large frying pan on medium-high heat, saute the onions in olive oil for about 3 minutes. Add the Matzo Farfel and saute for another 1-2 minutes. Then add all the vegetables and spices and mix well. Saute for another minute, and then add the chicken broth, let cook for about 3 minutes until the matzah farfel has soaked up all the broth. Add the egg mix everything together and remove from flame to cool. After the stuffing has cooled down enough to handle: take one of your flattened thin chicken pieces and add a large dollop of stuffing towards the end of the piece. Then roll the chicken over the stuffing creating a nice little oval shaped stuffed package. Place into your baking tray and repeat with the rest of the chicken and stuffing. When all the chickens have been stuffed and rolled, mix all the glaze ingredients together until smooth. Then using a pastry brush generously shmear every chicken rollup with the glaze cover all exposed sides, until you have finished all the glaze. Bake in oven for 1 hour, until chicken is fully cooked. In the meantime, prepare Manischewitz couscous according to package directions. 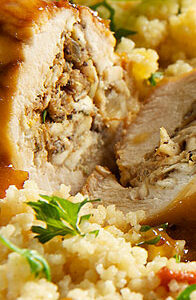 To serve, slice each chicken into 3-4 round pieces and serve plated over couscous.